Emergency kits are a crucial part of your emergency preparedness and planning. Disasters can happen without the courtesy of forewarning, which means when it strikes, you may need to leave at a moment’s notice. Keep a kit in an easily accessible location so you can grab it and go. Need help determining what you need in your kit? EverSafe MREs: 12-meals Case, Save $32! 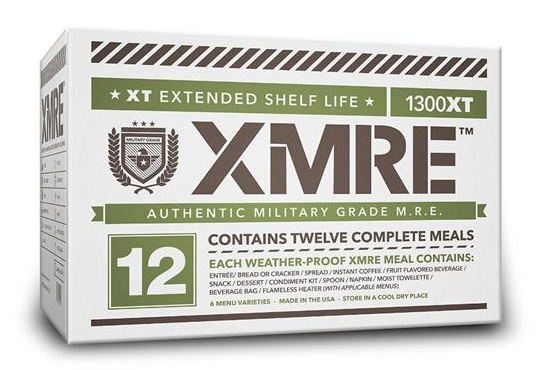 NEW: Extended Shelf-Life XMREs in Cases of 6 and 12 ... w heaters & in weather-proof bags! As Low as $66 shipped! Just listed in our store! These great new MREs offer an extended shelf life of 5 years or more when stored well. Each meal averages better than 1300 calories. At 2000 calories a day, a 12-meal case gets you more than a week of sustenance. Precooked, comes with flameless heater, but can be eaten hot or cold. These are selling fast--get them while we have them in stock. Buy now.